It has been generally thought that to successfully ventilate a roof it must be done from outside, that a hole must be made in the roof the underlay breached and a prominent external device fitted. That is not always the case - because now there is another way. There is virtually no disruption, in fact no external work whatsoever when using lapVent, so nothing shows. Originally devised for a demanding conservation industry, lapVent is proving to be even more valuable to new-build and mass refurbishment, as well as DIY, home improvement and general repair. 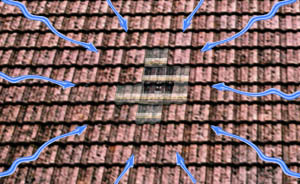 Probably one of the most important characteristics of a free laid slate or tiled roof, is its ability to breathe independently through its own surface, a feature that allows the whole of the lapVent system to be kept down below the rafter line, completely out of sight. Out of harms way under the tile battens and unaffected by outside forces, lapVent's 20,000mm2 free airway lays snugly between overlapping membranes, improving airflow beneath the cladding and transferring fresh air in and dank air out of loft spaces. this is indeed a truly innovative, cost effective step forward.